Red Truck is all about FOOD. We are a modern eclectic café and food truck committed to serving quality, sustainable meals at an affordable price. Red Truck is always on the move, on the road and in the kitchen – bringing you bold, addictive flavors. 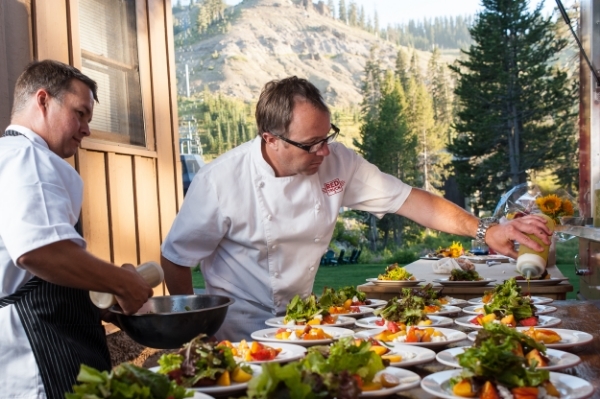 With 20 years of experience in professional kitchens and seven years owning and operating Red Truck, Chef Larry Abney has deep, strong roots in the Tahoe basin. Visit us at our café at the Truckee Tahoe airport or on the road at your next event. Located just about an hour outside of Reno, Hole in One Ranch provides their quality grass fed lamb and Heritage-bred hogs to Red Truck Cafe. Born and raised on grass pastures, with no hormones, antibiotics, animal bi-products, processed or packaged feed the sheep are able to graze nature pasture forages while the pigs enjoy room to roam and fully express all their pig-ness. Hole In One Ranch operates on a small scale providing truly local, sustainably and ethically raised meats..."It's good for the land and good for you." Nestled in the foothills of Newcastle, CA, Twin Peaks Orchards has been providing aromatic tree ripened fruit since 1912. Vineyard quality soil, hot days and cool nights allow for rich and flavorful fruits hand picked at the peak optimum maturity. Enjoy Twin Peaks Orchards peaches, plums, nectarines (and more!) in our Red Truck Cafe Farmer's Market Salad, galette pastries and house-made chutneys. With a network of farms within 100miles of North Lake Tahoe, Tahoe Food Hub has connected farms with local restaurants (like Red Truck Cafe! ), grocers and schools increasing access to nutritious and ecologically grown food. Partnering with Tahoe Food Hub has allowed Red Truck Cafe to help support over 17 farms from our county and over 25 farms in the surrounding foothill and valley farming communities. Let the food-gurus take care of your next event. Red Truck will show up approximately 1 hour before your event and park in your designated parking area. Once the serving doors are open unlimited food will be served for 2 hours. Once the allotted time is up Red Truck will pack up leaving your space clean and worry free. Red Truck will provide heavy duty plates, biodegradable utensils, napkins, and garbage bins. If you rent plates through a rental company, there will be an additional .50 cent cleaning charge per plate. Event price is subject to change based on end times, additional hours, additional guests & location. Late start charge: Red truck will leave 2 hours after the original agreed upon start time or client will be billed an additional $150 for each additional half hour. Due to the nature of this type of event, to-go’s are not allowed. Chef-Owner Larry Abney has 15 years of experience as a private chef in addition to catering weddings, parties and corporate events. With that experience, Larry and the Red Truck team continue to evolve and transform the thinking behind throwing a party! With big bold flavors and a kitchen on wheels, there isn’t an event too large (or small) that the Red Truck team can’t handle. Red Truck is a hassle-free and low-maintenance approach to entertain your guests palette with a mouth-watering menu. No matter the size of your next event, Red Truck takes the opportunity to connect and share our dedication to great food and celebrate innovation. We need a little space. Clients must verify that Red Truck is allowed to park at the event location site. If, for any reason, Red Truck is unable to park at the event, all monies for the event, in full, will be retained by Red Truck. Red Truck trucks cannot drive up hills with a 30% grade or higher. If you are ready to book your party, we are ready to feed you. Fill out the inquiry form by clicking on the big red button to your right. We'll get back to you within 24-hours or less.